For a latest promotional event, the 31-year-old actress chose to wear a beautiful powder pink colour sari with gold work and paired it with a dark green coloured blouse. Kangana had a special screening in New Delhi for the President at Rashtrapati Bhavan. She was spotted at the screening wearing a white and gold sari from Madhurya’s collection. The look was teamed with a kundan gold choker and stud earrings. For another promotional event, the Queen actor wore a yellow and gold silk sari. She wore a Madhurya creations sari with golden ethnic juttis. She combined her outfit with golden jhumkis. 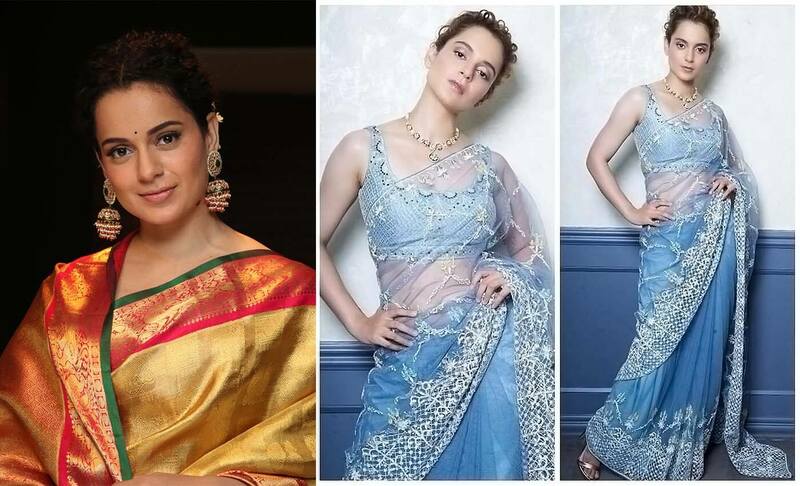 Kangana Ranaut personifies elegance in our gold gotta patti work sari overstated with Swarovski crystals. For the poster launch, she arrived in a handcrafted, floral jewelled net sari from ace designer Sabyasachi’s latest Udaipur collection which she teamed with matching jewelled blouse.